On the eastern side of the Great Smoky Mountains National Park, near the town of Bryson, NC, lies Lakeview Drive. The road winds its way through a section of the Great Smoky Mountains National Park along the northern shore of Fontana Lake. Eventually the road reaches a 1/4 of a mile long tunnel through a mountainside and then, just on the other side, the pavement stops. 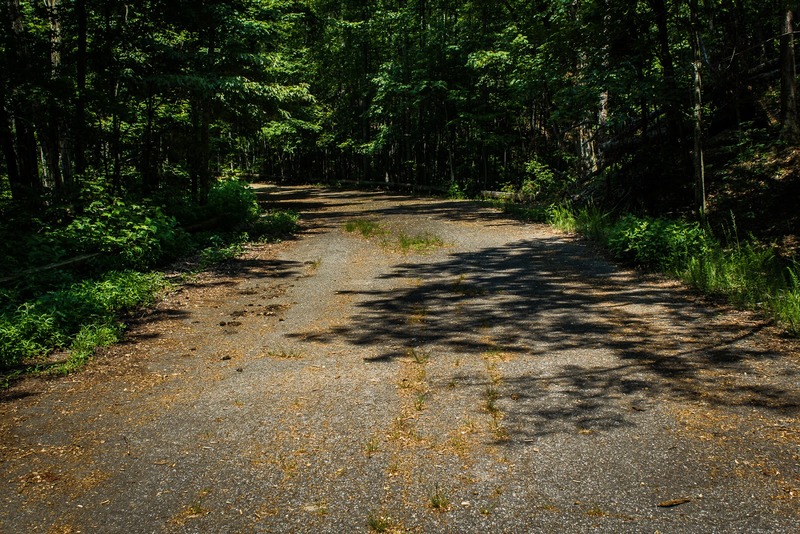 Lakeview Drive ultimately inherited the nickname "The Road to Nowhere" as a result. The road was not intended to stop just beyond the tunnel. It wouldn't make sense to spend a great deal of money and manpower to build a road through the mountain only to have it stop on the other side, but that's exactly what ended up happening. So what happened here? During World War II, the US Government and the Tennessee Valley Authority decided to dam up the Little Tennessee River for power generation. As the river descends out of the mountains, multiple little lakes were formed. Cool tip: one of these dams, Cheoah Dam near Deal's Gap, was used in the movie "The Fugitive". 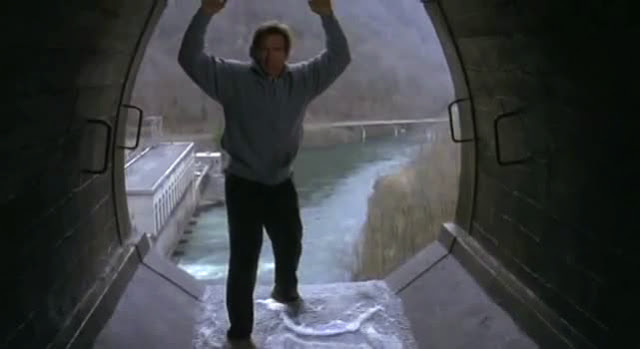 Harrison Ford takes a perilous leap off of this dam and magically survives. Closer to Bryson City a more significant lake was formed called Fontana Lake. The valley the lake would flood was home to many residents of Swain County. The government bought some of this land, but it also took large swaths of private property forcing the residents to move out of the valley. The US government promised to replace the road that once ran through the valley with Lakeview Drive. This new road would serve one very important purpose for the local people of Swain County and that was to have access to cemeteries where their loved ones were buried. 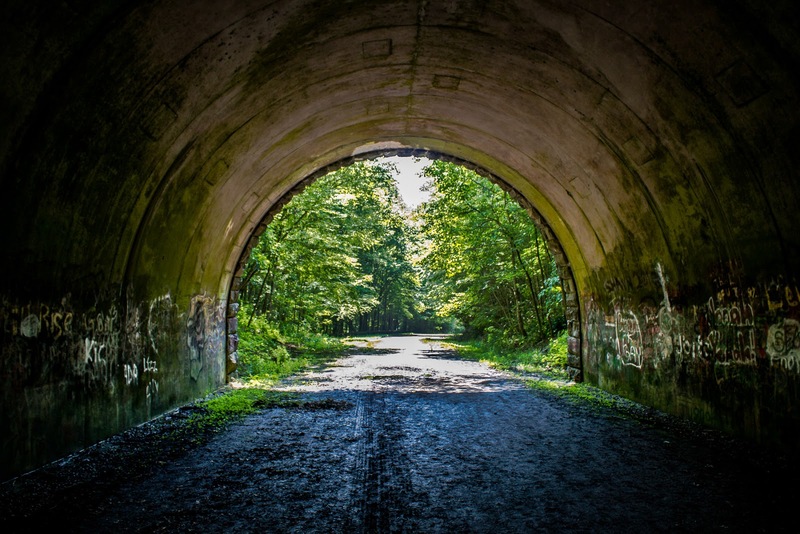 Almost 6 miles of road were built, including a bridge and the tunnel, but the remaining distance (approximately 26 miles) were never built because of environmental issues that sprang up. In the end, a promise was broken and the Swain County residents would not have access to their ancestral cemeteries. The road became a huge sore spot to the people of Swain County and Bryson City. This sentiment is perfectly spelled out on a sign you'll see as you leave Bryson City - "Welcome to The Road To Nowhere, A Broken Promise!". It should be noted that the National Park Service does offer periodic ferry services across the lake to take families to these cemeteries. In 2000 there was a bill that funded the continuation of the road, but to do this date, no further construction has occurred. 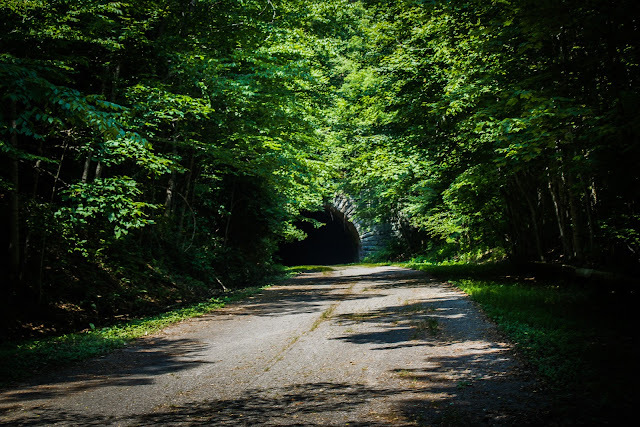 Today, The Road to Nowhere serves as access in to the Smoky Mountains and a number of trails in the area can be found here. There are a few scenic overlooks that offers the usual views of hazy mountains, but with the added element of water down below in Fontana Lake. 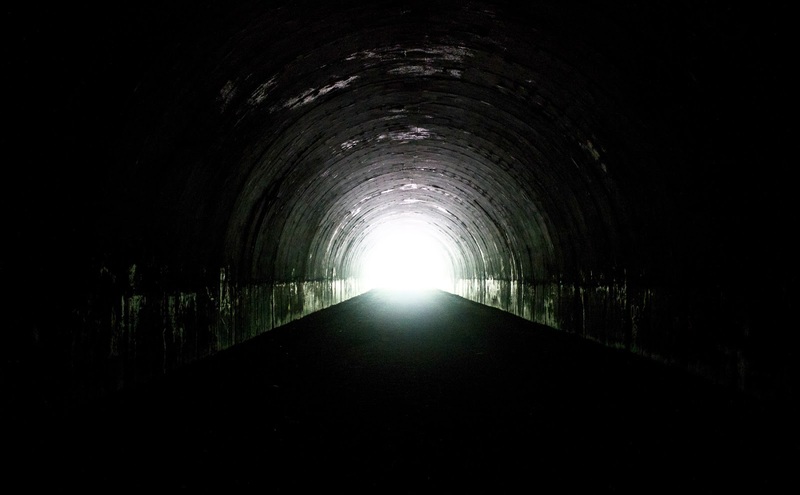 The tunnel itself is worth checking out and the drivable portion of Lakeshore Drive ends just before the tunnel. There's a large parking lot to accommodate the visitors to the tunnel. Throughout the tunnel you will find graffiti that visitors have left. This is another sore spot for Swain County and they are making attempts to work with the National Park Service to clean this up. Bryson City is an interesting town worth visiting. There are some good restaurants to eat at (Everett St. Diner was very good) and it's also home to the Great Smoky Mountain Railroad that offers rail excursions down through the Nantahala Gorge. Bryson City also provides access to another section of the national park called Deep Creek. 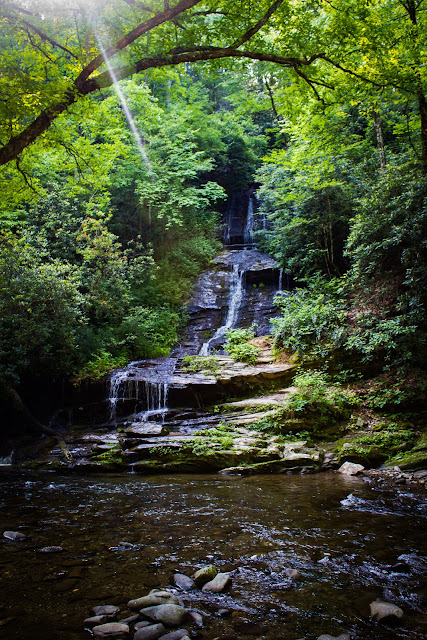 This area offers a few waterfalls and some nice hiking trails. You're also not all that far from the Nantahala Gorge which we highlighted in this post. Many visitors to the gorge stay in Bryson City since there are a limited number of options to stay in the gorge. 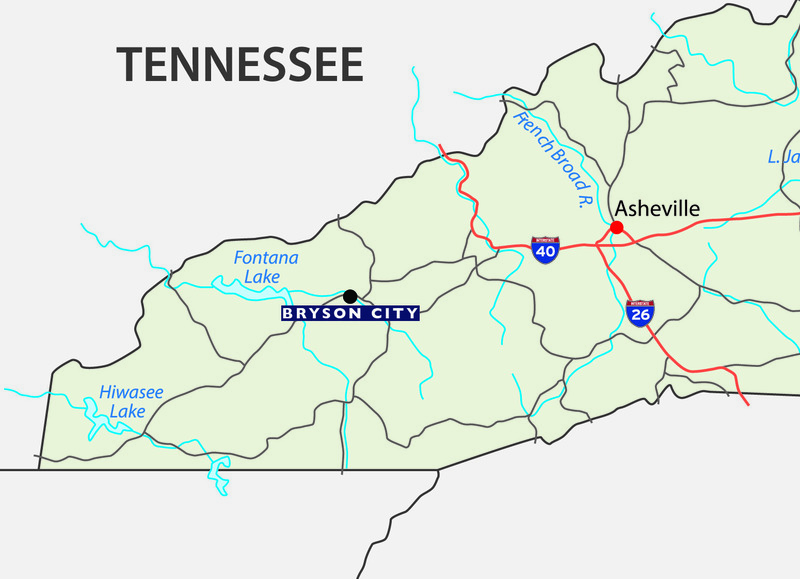 You can access Lakeshore Drive from Bryson City, NC in Southwestern North Carolina. The road starts in town as Fontana Road. 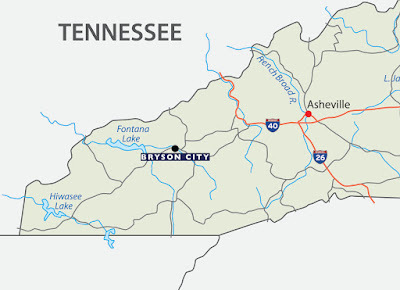 For more information about The Road To Nowhere and nearby Bryson City, check out this page.